When indulging yourself and shopping for jewellery you should be able to do it in an environment that is as beautiful and individual as what you are about to take home. Designed by Woods Bagot, LK Jewellery’s new boutique stores in Melbourne and Sydney speak to their sense of place and boast ‘ultimate prestige’ through the embodiment of clean-lines, combined with a sophisticated and luxurious material palette. “The contemporary aim of the concept design for both the Melbourne and Sydney boutiques was to strengthen the image of this strong and cherished family brand, whilst appealing to both the existing clientele and the next generation of customers,” said Trish Turner, Associate, Woods Bagot. On the exterior, a links façade reflecting that of the link watch resonates in both boutique stores; elegantly symbolising LK Jewellery’s core product offering. Internally, a series of semi-translucent ‘jewellery boxes’ are also housed within the space, showcasing the high-end jewellery on offer. “Both stores work on the premise of one big open space that is surrounded by full height joinery with the exception of the centre of the store, where a series of low-height counters enable customers to weave through the space; thus creating a sense of intimacy throughout the store,” continued Trish. 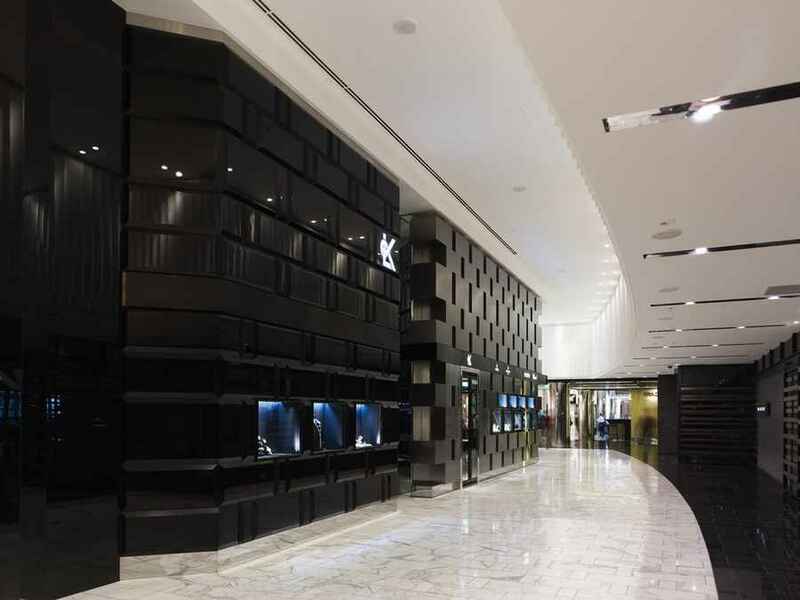 Located in Melbourne’s prestigious Crown Entertainment Complex, LK Jewellery’s flagship store sits alongside the world’s leading designers such as Prada, Louis Vuitton and Burberry. Unique to the Melbourne boutique is a double-height V.I.P. room encased with a black high-gloss finish that is housed by a jewel façade – offering clients complete privacy and luxury. “A finishing touch of baf resin panels and led lighting to the jewel façade has also brought the surface to life with an exquisite sparkle,” said Trish. Additionally, distinctive to the Melbourne store is the discreet staircase that wraps around the northern end of the boutique connecting the first and second floor – leading up to LK Jewellery’s studio and office. A smaller edition of the Melbourne boutique, LK Jewellery’s Sydney store is situated in Sydney’s recent addition to its high end entertainment precinct. Distinctive to the Sydney store is that it also houses both a Rolex and Patek service room. The Sydney boutique launched in style in early February, and the Melbourne flag ship store is already open for business.